Truly a one-of-a-kind. 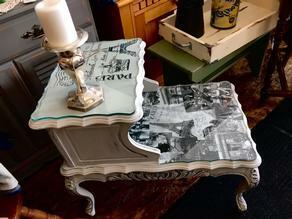 The top covered with vintage black & white street scenes from Paris. The step back top stenciled. Thick glass on both sections. I can see this table cuddled up next to a black leather couch or in a salon reception area. Ready to go for $165.